MAURA, Brunei - The 20th annual Cooperation Afloat Readiness and Training (CARAT) Brunei commenced at Maura Naval Base in Brunei, Nov. 10. Original CARAT partners, Royal Brunei Armed Forces (RBAF) have participated since the exercise began in 1995. CARAT Brunei marks the final phase of the 2014 series, which began in May with partner nations in South and Southeast Asia. It provides a credible venue for regional navies to share best practices, foster relationships and enhance maritime security cooperation. 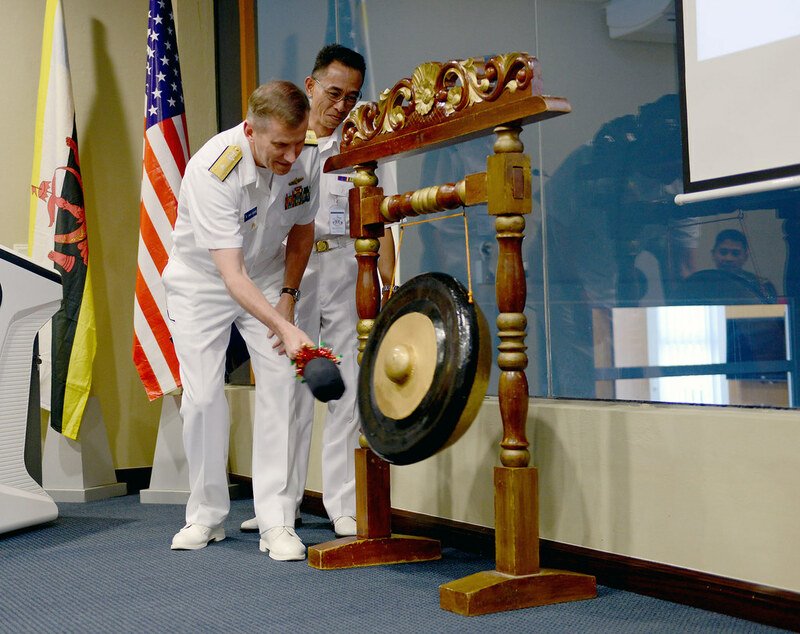 Rear Adm. Charlie Williams, commander, Task Force 73, and U.S. 7th Fleet's executive agent for Theater Security Cooperation in South and Southeast Asia delivered remarks to participating U.S. Navy Sailors, U.S. Marines and members of the Royal Brunei Armed Forces. "The sea has connected our nations, our people and our naval forces since the USS Constitution visited Brunei for the first time in 1845," said Williams. "As our premier naval exercise rooted in longstanding cooperation at sea, CARAT Brunei provides unique opportunities to sharpen skills and work together in ways that will serve our nations and the region for many years to come." Continuing through Nov. 14, this year's exercise features several new events including maritime security, search and rescue and aviation maintenance symposia ashore, as well as shipboard helicopter operations and a simulated medical evacuation (MEDEVAC) at sea. Additional symposia ashore will bring together professionals from both navies to discuss best practices in military law and military medicine. Japan Regional Maintenance Center divers will train with their RBAF counterparts in hull inspection and surface supplied breathing techniques. Community service events and joint performances by the U.S. 7th Fleet and RBAF bands will occur throughout the local community. A platoon of U.S. Marines from 3rd Marine Expeditionary Force will conduct military operations on urban terrain training with their Royal Brunei Land Forces counterparts at the Fibua Military Operations on Urbanized Terrain complex. At sea, USS Rodney M. Davis (FFG 60), embarked with Destroyer Squadron 7 commodore and staff and an MH-60R helicopter, will train with the Royal Brunei Navy ship, KDB Darulaman (P-08), and a Royal Brunei Air Force S-70A helicopter. In addition to maneuvering and surface gunnery drills, highlights include maritime boarding scenarios, RBAF crossdeck landing qualifications aboard Rodney M. Davis, and a maritime domain awareness exercise involving both helicopter versions and the P-3C aircraft. Capt. Fred Kacher, Destroyer Squadron 7 commodore and exercise commander, discussed the upcoming sea phase following the ceremony. "We deeply value our naval partnership with the RBN, as evidenced by their participation in both the Rim of the Pacific exercise earlier this summer and the Southeast Asia Cooperation at Sea exercise in August, " said Kacher. "This week's CARAT is another great opportunity for our navies to get out to sea together and strengthen our ability to operate safely and professionally with one another."